Anyway, onto the lipsticks I picked up. I bought four shades, as I said; Miss Sophia, Miss Amy, Miss Simone and Miss Kitty. Miss Sophia is marketed as a lilac, however I would describe it as a dusty cool toned pink. Miss Amy is a baby blue based pink. It's a perfect Sophie lip colour and a colour that I can see myself getting a lot of wear out of. Miss Simone is a baby coral colour that, again, is so me. It's a really pale and wearable colour and, much like Miss Amy, I know I'll get a lot of wear out of it. Last but not least is Miss Kitty. Miss Kitty is a described on the site as a black plum shade. It's a really dark wine/plum lip colour and I think it's the perfect addition to an Autumn/Winter lip collection. In fact, I featured it in my Top 10 Winter Lips post. All four of the lipsticks shown above have the Shanghai Suzy's matte lip formula and, if I'm honest, that really scared me before they arrived. Anyone who reads this blog regularly will knows I'm not a big fan of matte lips. For a matte lipstick I find these Shanghai Suzy lipsticks to be really comfortable on the lips. They're a little more dry than my favourite lipstick formula (MAC Cremesheen and the like), however they're definitely not uncomfortable and, more than that, they're not drying on the lips! The wear time on the four Shanghai Suzy lipsticks I own is pretty nice. They seem to last three to four hours, though I'm a serial lip product re-applier so I tend to reapply long before a product actually needs it. No one wants faded lipstick, do they? I feel like the matte formula helps them stay on the lips better than creme formula so I know I'll find myself reaching for these when I need extended wear from my lip colour. Last, but not least, I need to reference the smell of the Shanghai Suzy lipsticks. These lipsticks smell like grape bubblegum (any other 90's kid having a flash back to Grape Hubba Bubba? You're welcome) and I absolutely love it. I know the scent won't be for everyone as it is quite strong if you're not fond of it, however I find myself reaching for these bad boys just to smell them! The scent doesn't linger too, disappearing almost instantly when applied to the lips. All in all, I would highly recommend the Shanghai Suzy lipsticks. They're extremely affordable, retailing for only $12.95 (though I managed to get mine in a three for four deal so look out for promos! ), and I think the quality is really great! These lipsticks are and available online and there's also a fairly large selection of independent retailers and beauty salons which sell Shanghai Suzy lipsticks. I can't wait to see what colours Shanghai Suzy releases in their Spring/Summer Collection. What kind of colours would you like to see? 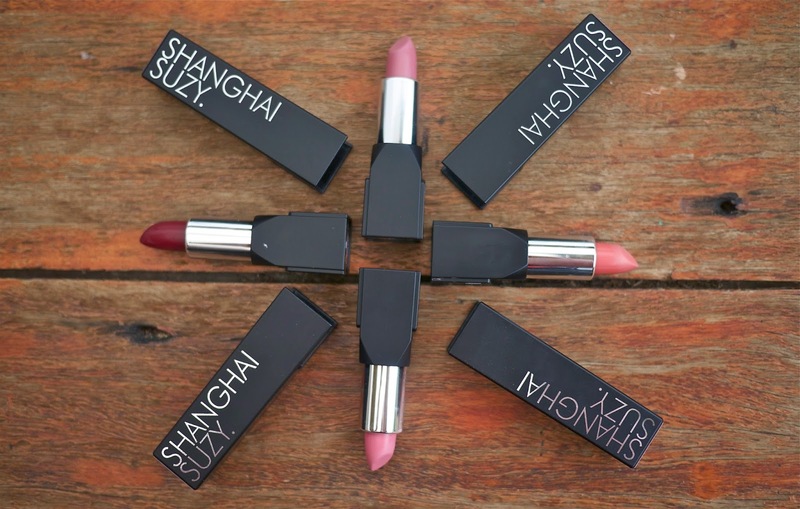 Also, what do you think of the Shanghai Suzy lipsticks? Do you like the look of them? Have you tried any lipsticks from them? Let me know if you'd like to see any of these lipsticks in a Face of the Day post too! Hubba bubba? Interesting! I'm not fond of matte lips either but if they're not drying, that's a good sign! The shades look great, I love the look of Miss Simone. I've been hearing a lot of good things about these, and for the price they seem amazing! I really like the look of Miss Simone. Love the look of Miss Sophia and Miss Kitty! But geez, lim eds get me each and every time!